If you love working with animals and are committed to relieving the suffering that comes from traumatic injuries or chronic illnesses, veterinary medicine could be a good career choice for you. The pre-veterinary medicine advising program at UMHB is designed to help students who plan to attend veterinary school by providing them with information and support they need as they prepare for and apply to veterinary school. Students wishing to pursue a career in veterinary medicine may major in any field of study, as long as they also complete the foundational courses in biology, chemistry, physics, and mathematics that veterinary programs require. UMHB’s pre-veterinary medicine advisors are equipped to help you tailor your studies to your particular interests, complete the foundational coursework required for veterinary school, and navigate your way through the application process. They can provide a sample schedule of courses showing how you can complete your degree in four years and complete the needed prerequisites. Dr. Cathleen Early serves as the advisor to pre-veterinary students. What courses do I need for veterinary school? The Association of American Veterinary Medical Colleges maintains a list of course prerequisites required at veterinary schools across the country. The Graduate Record Examination is required by most veterinary schools, and some also require the Biology GRE. The Medical College Admission Test (MCAT) is accepted by some schools in place of the GRE. Chelsea Kosar '14 majored in biology with a minor in chemistry at UMHB, with the goal of becoming a veterinarian. 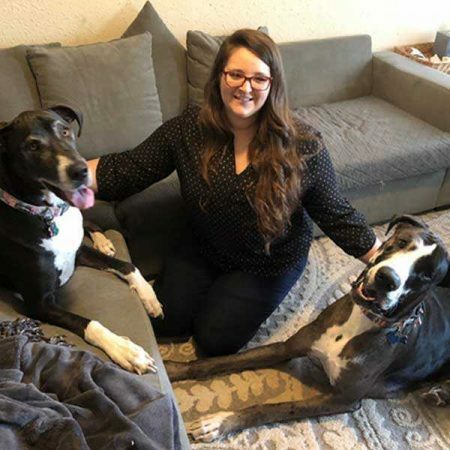 She spent a year after graduation applying to vet schools and working as a veterinary technician, until she was accepted into the veterinary program at Texas A&M. Now in her third year there, she says UMHB prepared her well for her graduate studies. How can I meet other pre-veterinary students at UMHB? What veterinary programs have accepted UMHB alumni? Pre-vet students from UMHB have gone on to study at Texas A&M University, which offers the only veterinary medical college in Texas. Pre-veterinary medicine students are encouraged to establish a connection with a member of the Pre-Health Professions Advisory Committee as soon as they enroll at UMHB. Members of the committee serve as advisors for students pursuing careers in veterinary medicine. The committee is also responsible for writing students’ letters of recommendation when they begin the application process.